Home » Microfluidics-based cell culture » Is Now the Time to Move Your Research to 3D Cell Culture? Mammalian cell culture has been used in research and drug discovery for many years. The use of this technology has resulted in many key discoveries in developmental biology, disease modeling, large-scale protein production, tissue engineering, stem cell therapy and lifesaving therapeutics. Traditionally, for adherent cell types, this work has been done in 2D culture as this was both easier to set up and maintain. 2D culture has since become standard practice. However, 2D culture has limitations, primarily the inability to mimic in vivo conditions of the cellular microenvironment and thus provide accurate physiological relevance. Primarily the 2D shortfalls stem from the inability of cells to grow as they would in the body. Native cells do not grow in 2D, almost all grow in an extracellular matrix that provides the 3D architecture. This 3D architecture allows cells to communicate with other cells through biochemical and mechanical means. This communication network allows cells to regulate their life cycle and maintain homeostasis, functions that may be lost in a 2D environment. While we have developed technologies to improve 2D cell health and viability, without the 3D architecture these cells have significant differences when compared to both 3D cell culture models and native tissue. 3D cell culture models have been developed to address these challenges. It has been found that 3D cell cultures can establish the kind of cell-to-cell and cell-to-extracellular matrix interactions observed in native tissue and results in greater relevance for in vivo modeling than 2D cultures. This makes 3D cell culture systems a better choice for research that involves testing or modeling where in vivo biological relevance is desired. It has been well established that 3D culture is more biologically relevant and better able to mimic the in vivo state, but why is that critical? Here are some key areas where 3D culture is making a difference. 3D culture models can be used to predict and model drug responses for drug compound screening and toxicity testing. This kind of information is critical in both the discovery and testing of drugs. With the increasing cost of clinical trials and the increasing complexity of treatments, it is critical that drug discovery efforts be more precise and predictive. 3D models can create systems to mimic healthy cells or diseased cells and by using these systems, researchers can evaluate cellular responses to different drug candidates early in development. Unexpected toxicity is frequently uncovered in clinical trials. Preclinical testing is often done in 2D culture models, which can be less predictive and physiologically relevant than 3D models. Identifying toxicity issues before extensive pre-clinical and clinical trials allows companies to save money by halting work on drugs that are not efficacious or that have toxicity issues. It can also reduce the rate of drugs that drop out of clinical studies later due to issues previously undiscovered. The “disease in a dish” model is applicable across a wide range of disease types and allows researchers to conduct extensive research about a disease. This method of study has been used to investigate the effect of viruses on healthy cells and in vaccine and anti-viral drug development. drug compound screening where there is extensive evidence that 3D models frequently respond differently to compounds than 2D models. Researchers can also culture tumor cells and conduct tumor invasion assays with embryoid bodies to visualize the invasion of cancer cells and also screen inhibitors. “Intestinal Organoid Culture: a Convenient and Physiologically Relevant Model for Intestinal and Stem Cell Research”. 3D cell culture has also been shown to be more effective in the study of cell-to-cell interactions and cell-to-extracellular matrix interactions. In addition, studies on cell proliferation, cell viability, cell differentiation and cell migration are also more physiologically relevant in 3D models. 3D cell culture modeling is also important in stem cell research for cell differentiation studies and regenerative medicine applications. The most common 3D culture models are spheroids (3D cell aggregates). They can be generated from a wide range of cell types and methods. Spheroids form spontaneously as a result of cells becoming more attracted to each other than they are for surfaces they are exposed to, forcing cellular aggregation and the formation of spheroids. Some examples of multi-cellular spheroids are embryoid bodies, mammospheres, tumor spheroids, hepatospheres and neurospheres. While the benefits of implementing 3D culture are clear, it is only recently that implementation has been growing rapidly. The reason for the sudden interest is that tools and technologies have recently been developed to make 3D culture more efficient and high throughput. To address these concerns and make implementation simpler and more efficient, tools and technologies have been specifically designed to address some of these challenges. culture. The hanging drop method is labor intensive and requires the transfer of spheroids to a separate receiver plate prior to assaying, which can be a difficult process that takes time and skill. This method also makes medium exchanges and adding compound difficult. In order to provide a simpler and more straightforward method for culturing spheroids, Corning designed a specialized microplate for spheroid culture. The multiple well, cell culture microplate has clear proprietary round well bottom geometry and an ultra-low attachment surface coating. The black microplate body with extended cross-walls was designed specifically to reduce cross talk during fluorescent and luminescent based assays. These design features enable highly reproducible growth of 3D cell spheroids that are consistent in size and are centrally located within each well. In addition, the cell culture techniques used with these plates, including media exchanges and adding compounds, are similar to regular cell culture techniques and can be automated. The clear well bottom has also been designed to enable imaging, which can be done in the same plate without the need for a transfer step. The plates are available in 96 and 384 well formats and are compatible with many microplate readers and imaging devices, including those available from Molecular Devices, Biotek, Acumen and Tecan. challenging to image a 3D culture than a 2D culture. More specifically, how do you make the process high-throughput to enable screening of a large number of compounds? 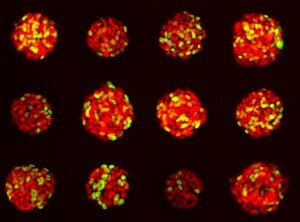 In a recent webinar given by Molecular Devices, “Setting up 3D spheroid assays using high-content imaging,” the company described both the high throughput imaging and analysis of spheroids by walking through the use of their ImageXpress Micro system in combination with their MetaXpress Software to image 3D spheroids. Molecular Devices began by describing options for growing spheroids including using scaffolds, extracellular matrices, hanging drop method using plates by 3D BioMatrix and Corning’s Spheroid Microplates. They chose to use the round bottom Spheroid Microplates by Corning (described above), which produced spheroids with a very consistent size and shape (width varied less than 10%). Also very important for imaging, the spheroids were self-centered in the wells. They also were able to capture spheroids in a single image to compare spheroids of different size and phenotype. To image the 3D spheroids multiple images are taken in vertical z planes. This creates z stacks of images that can either be left as individual images or can be collapsed into a single image. The MetaXpress 6.0 Software allows for easy analysis of the 3D data and the analysis can be tailored to meet individual needs. This process enables high throughput imaging and analysis, as analysis can occur simultaneously as the plate images are being acquired. The webinar goes on to describe examples of high content 3D spheroid assays for compound screening in cancer spheroids. It is well recognized that 3D culture is the preferred method where physiological relevance is required. The challenge has been how to conduct this research in a way that is simpler, more consistent and efficient. In addition, it has to be compatible with a high throughput workflow that includes automation, screening and imaging. While use of 3D culture is growing, these tools and others currently in development will likely bring 3D culture into widespread use, thus creating a new standard practice.